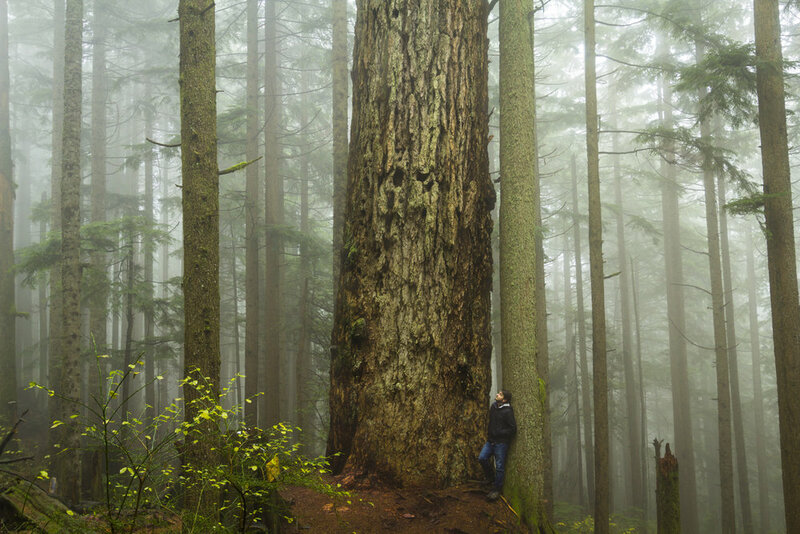 British Columbia’s giant tree forests can be divided into two main regions: Vancouver Island and Lower Mainland. Together with the Olympic Peninsula, Vancouver Island is the epicenter of Cascadia’s old-growth forests. It receives enough rain to produce wonderfully lush, green landscapes and prevent widespread fire outbreaks, permitting fire-sensitive trees like Sitka spruces to grow for centuries. The island has been the site of many conservation battles due to its logging past but several protected areas, including Carmanah Walbran Provincial Park, Avatar Grove, Pacific Rim National Park Reserve, Cathedral Grove, and Meares Island provide beautiful glimpses into the beauty that once covered the entire island. Lower Mainland encompasses greater Vancouver and several wilderness areas to the east. It’s largest trees typically grow at the foothills of the mountains that extend south into Washington’s Cascade Range. Several trails in Chilliwack Lake Provincial Park and Skagit Valley Provincial Park allow backpackers access into British Columbia’s best forest hikes. 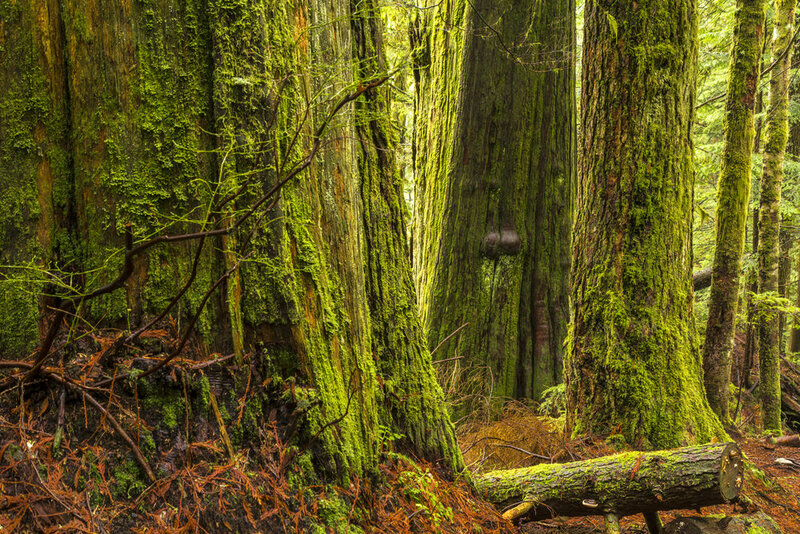 Located on the southwestern section of Vancouver Island, Carmanah Walbran Provincial Park is perhaps the most remarkable and wildest big tree forest in Vancouver Island and perhaps all of Canada. The park protects extensive tracts of luxuriant Pacific temperate rainforest, and is famous for its ancient old-growth, which includes giant western redcedar, coast Douglas-fir, western hemlock, and Sitka spruce. The park is best know for its spruces, which have grown to record sizes. The park protects sections of two primary valleys accessible to hikers, the Carmanah Valley and the Walbran Valley, both of which contain trees of gigantic proportions. Carmanah Valley is home to a wonderful boardwalk trail that leads to both the Randy Stoltmann Commemorative Grove (picture one) and the interestingly-shaped “Heaven Tree” (picture two). 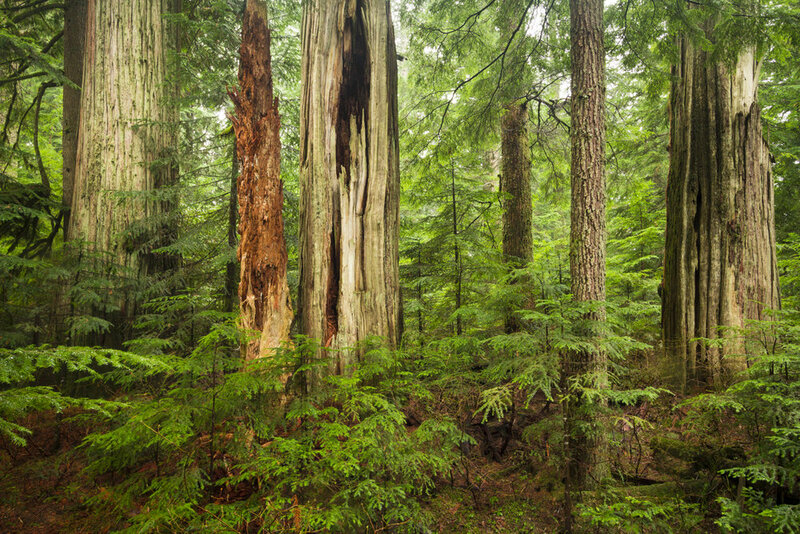 The Walbran Valley is also home to record spruce trees but is, unfortunately, still the site of conservation battles between environmentalists and loggers. 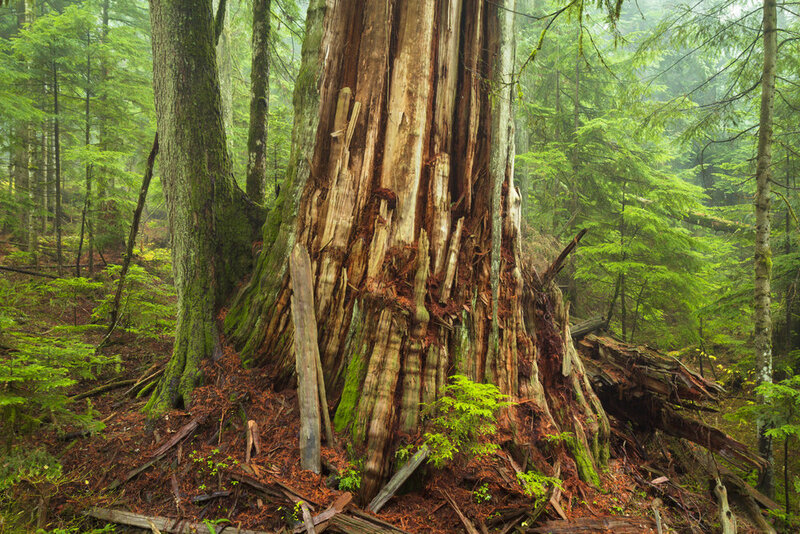 Tucked in the southern portion of Pacific Rim National Park Reserve, the Cheewhat Lake Cedar Trail weaves around for a short 1.2-miles through exceptionally large trees and terminates at the world’s largest know western redcedar, the Cheewhat Lake Cedar (picture one). The girth of the Cheewhat Lake Cedar is measured at an astounding 18.34 meters (60 feet), it reaches a height of 55.50 meters (180 feet), and contains 450 cubic meters of timber volume. The rough trail is takes a bit of concentration to follow but can be navigated fairly easily. The giant isn’t the only big tree along this trail. Several enormous western cedars, both standing and fallen, can be seen in the area. In addition to the trees east of Cheetwhat Lake, there are incredibly large trees north of the lake, which require a bit of bushwhacking to reach. 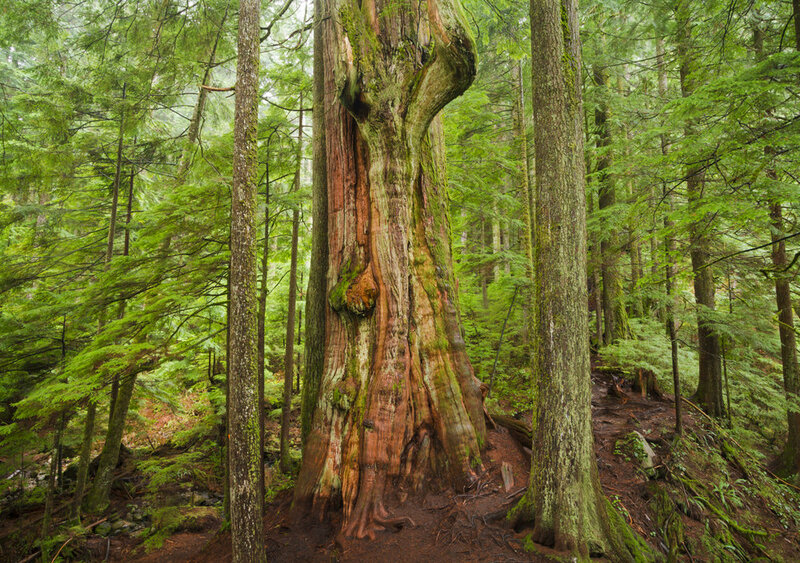 The recently discovered Avatar Grove just north of Port Renfrew consists of two designated trails (north and south) passing through giant western red cedars and rare Douglas firs. Some of the oldest trees here have contorted themselves into bizarre shapes and developed interesting patterns, including “Canada’s Gnarliest Tree” — an ancient cedar with twisted wood (picture one). The trails were built (and its name was chosen) in an attempt to bring tourist attention to the area and prevent further logging. The small, sleepy town of Port Renfrew, British Columbia has become the unofficial “big tree capital” of Vancouver Island (and all of Canada) by attracting tourists from all over the world who seek to explore a series of massive trees and groves outside of the city limits. These giants are widely recognized as exemplary for their massive sizes. 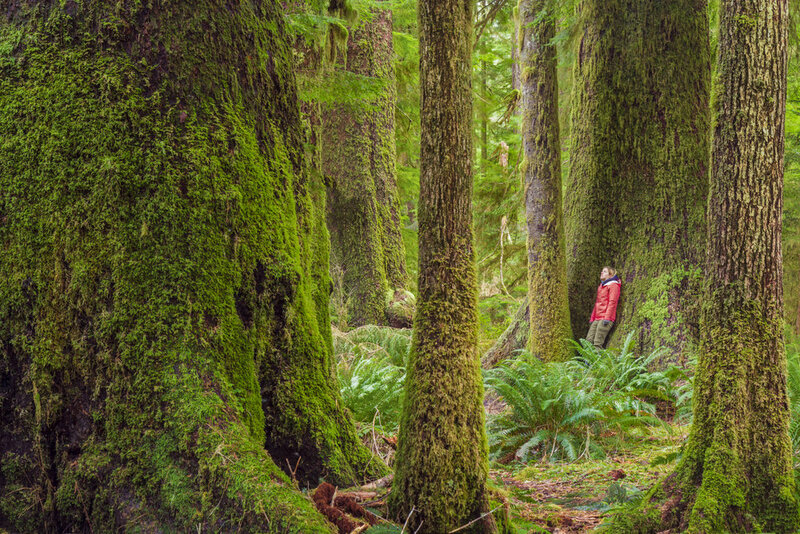 Notable trees include the Red Creek Fir (the world's largest Douglas Fir - picture one), the Harris Creek Sitka Spruce, Big Lonely Doug, the Chin Beach Trail Lone Cedar (picture two), and the San Juan Spruce (Canada’s largest Sitka spruce). Vancouver’s signature park, Stanley Park, is a wonderful urban oasis with awesome, cliff-side views of the city’s Inner and Outer Harbors, and, of course, the largest remnant of old-growth forest in the metropolitan area. I’ve found that the largest and old trees are primarily situated on the southwestern section of the park, west of Highway 99 (Stanley Park Causeway). All three of the photos pictured here, are taken by exploring the dozens of informal side trails that branch off of the paved trails. Some of the most ancient cedars and Douglas firs in the park are located south of the east-west Meadow Trail & Lake Trail, and north of Lees Trail. The best section to focus on is around the Lovers Walk/Tatlow Walk and explore north and south of there. Some of the cedars right off of these Walks are amazing but it’s always best to push into the forest for a more authentic experience. The steep mountainsides of the Lynn Valley filter plenty of rain and precipitation down their steep slopes throughout the year, nourishing the giant trees that grow there. Several trails that cut into the old-growth forest are shared by hikers and mountain bikers alike. 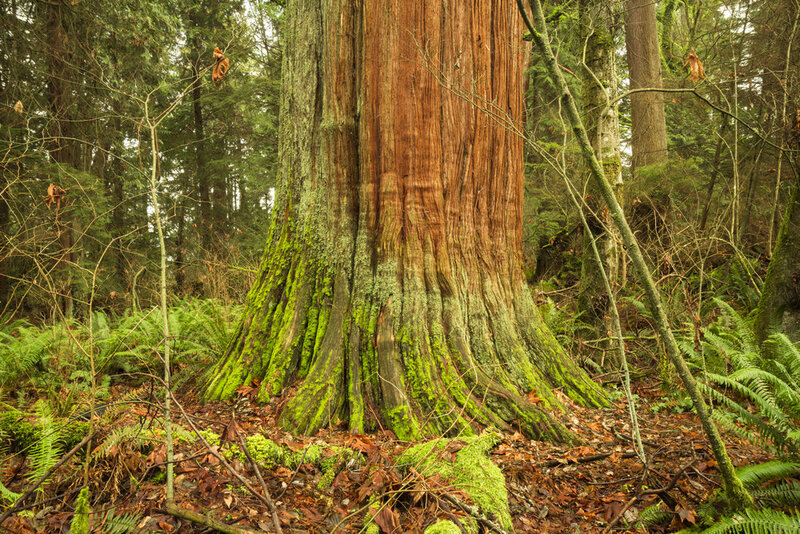 Though much of the original woody vegetation has been logged and sizable stumps remain as monuments to an earlier era, there are a few huge western red cedars found on the park’s unmaintained west trail. Most hikers know about the 600 year-old specimen on this “Cedar Trail” (picture one) but only a small fraction know about the side trail closer to the beginning that leads to an even larger cedar (picture two) as well as a big Douglas fir. Though short, this side trail is rough and takes some route-finding skills to follow. 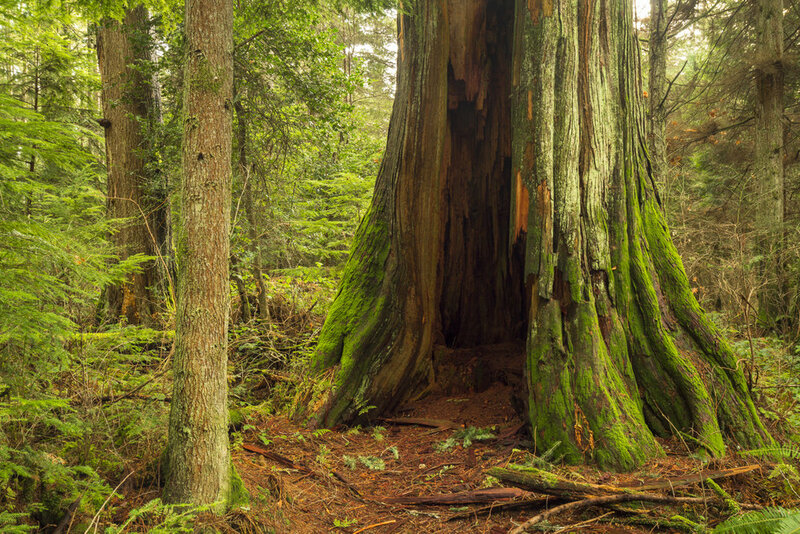 Randy Stoltmann’s “Hiking Guide to the Big Trees of Southwestern British Columbia” describes a short path leading to a small patch of large trees near a ski lift in Cypress Provincial Park. Though the path can be found, it has fallen into disrepair since the book’s publishing and one must bushwhack and navigate up, down, and around blowdown to follow it. Regardless, the big trees that Mr. Stoltmann describes are still there. Some are alive and some are decomposing but they grow close to each other and look beautiful together. A network of trails weave around an ancient forest at the foothills of North Vancouver’s mountains in an area known as Hollyburn Ridge. Though the Ridge’s largest cedars were logged in the 1920s, several pockets of old-growth remain, including two of the largest Douglas firs in Lower Mainland, the Hollyburn Fir (picture three) and the Candelabra Fir (picture four). The Brother’s Creek Loop Trail is perhaps the best trail to use to experience this forests’ majestic cedars (pictures one and two), while the Crossover Trail provides access between the aforementioned giant firs. When wet, this area often collects significant mist, giving it a overwhelmingly otherworldly feel.